Keywords Asset revaluation, operating performance, taxable income, financial reporting DC motor, BLDC, reluctance, converter, electric vehicle, hybrid DMAIC, claim, warehouse Facade Media, Reklame, Visual, Image Inflation, BI Rate, BI7DRR, Monetary, Policy MSC-CM, insulin sensitivity, IRS-1tyr612, type 2 DM Rohingya, Rakhine, Governace, Environmental, Place and Space Politics, ARSA Tensile strength, landcover The rights of the child to be heard, teaching, learning body dissatisfaction, dietary behavior, college student, body image culture shock, social adjustment, Papuan students electrical devices, management, setting, rasberry pi, saving power figurative speech, ritual language, Eastern Sumba ishing communities , bandengan village , process fisheries products , ready to eat products planning, marketing, operational, SDM, finance. Conflict in Rakhine Myanmar involving local majority ethnic minorities has seized the world's attention. Mainstream media generally preach this conflict as a racial conflict dilator dilakangi by history, politics and trust. However, when further examined under the Environmental Governance study, the conflict is also not separated from the natural resource management dispute which is suspected to start from the state policy to open the door of foreign investment. Included in Libraryan Reaserch, this study uses research methods that refer to library research, which is data collection based on written sources of scientific journals, mainstream media, books and other scientific sources. In addition, this research uses descriptive data analysis method. In writing this scientific paper the authors use the Environmental Governance approach focused on the study of Environmental Justice to analyze data that is not numerical. In explaining the factors causing the Rakhine and Rohingya ethnic conflicts in Myanmar in 2012, the authors use John Rawls about Justice, that justice is needed when ther is cracuty “Scarcity of material”. The results show that Rohingya and Rakhine ethnic conflicts can not be separated from the problem of environmental injustice. the factors causing the conflict are seen from the structural factors of the state policy on the investment of natural resources by foreign and ethnic geography, by conducting space politics "Place and Space politics", the government issued a policy of citizenship in the Citizenship Act which ultimately makes the state seem to have no legitimacy in granting civil rights to the Rohingyas. in the form of political discrimination, political elites controlled by the military junta with the omission and provocation by utilizing racial and religious sentiment with the aim of modernizing Rakhine Province with the existence of the Shwe gas exploration project. In addition, a massive exodus of the Rohingyas from Rakhine emerged, until the last armed movement called Arakan Rohingya Salvation Army (ARSA) emerged as a response of ethnic spirits as a crisis response. Agusta, I. (2003). 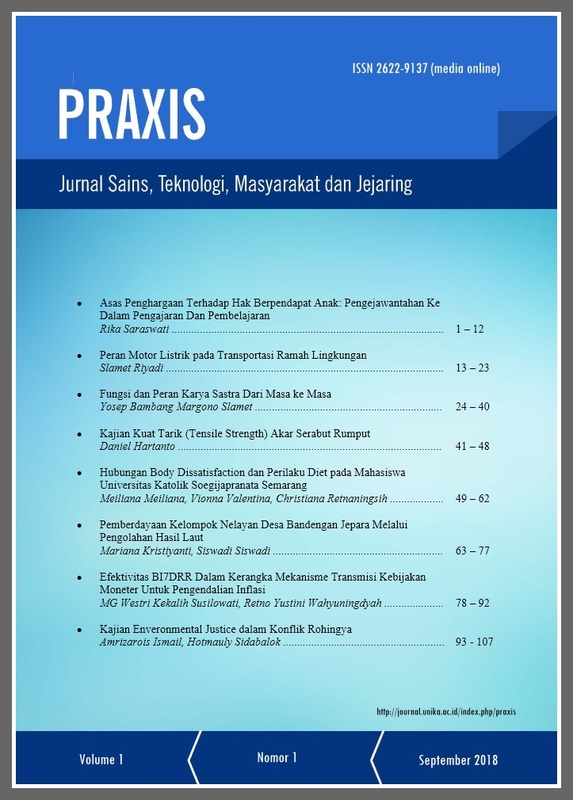 Teknik Pengumpulan dan Analisis Data Kualitatif. Pusat Penelitian Sosial Ekonomi. Litbang Pertanian, Bogor. Anderson-Scott, R. M. (1997). Religious beliefs, self-esteem, and psychological adjustment of African-American women in the black church. Dissertation Abstracts International: Section B: The Sciences and Engineering. Dyah Ratna Meta Novia, A. Y. (2018). Motif Bisnis di Balik Krisis Rohingya? Republika.Co.Id, p. http://internasional.republika.co.id/berita/intern. Revolusi, A. (2013). Causative Factors Rakhine and Rohingya Ethnic Conflict in Myanmar in 2012. Ilmu Hubungan Internasional, FISIP, Universitas Jember (UNEJ). Robinson, W. (2009). Saskia Sassen and the Sociology of Globalization: A Critical Appraisal. Sociological Analysis. Wouters, H., & Bol, D. (2009). Material Scarcity. Technology.